Virgil Michael Brand was a charter member of the predecessor Chicago Numismatic Society and served as its President 1908-1909. He joined the Chicago Coin Club during its first year of existence, becoming member number 55 on Dec. 3, 1919. Mr. Brand retained his membership the rest of his life, though he soon stopped coming to meetings due to failing health. While he never held office in the club, he exhibited rare gold coins at its ninth meeting as a visitor. And the great collector had an impish side: at the January 7, 1920 meeting he amused members by reciting a humorous poem (probably his own composition) entitled “The Quarrel of the Coins,” in which the characters were an Indian Head cent of 1909, an 1883 nickel without cents, an 1802 half dime, an 1804 dollar, and “the villain,” who was a coin collector. This was greatly appreciated, and attendees clamored for more! Mr. Brand (Jan. 16, 1862 – June 20, 1926)’s father Michael came from Germany in 1848 and later moved to Blue Island, where he found work as a brewer and where Virgil was born. Michael was soon made a partner in the firm, and Busch & Brand’s beer became so popular that they had to make daily trips to supply Chicago’s saloons. After a dispute, the business was divided, with Michael Brand & Company being established in Chicago. This business eventually merged with other brewers, and was later sold, allowing Michael Brand to retire a wealthy man. Virgil Brand graduated from Bryant and Stratton College in Chicago and went to work as a bookkeeper for his father’s firm. He became secretary and treasurer of the brewery with one tenth ownership, and received a great deal of money when his father cashed out. In 1899 he established his own brewery, the Brand Brewing Company, with an eventual capital of $1,000,000, which operated until shut down by Prohibition in 1920. 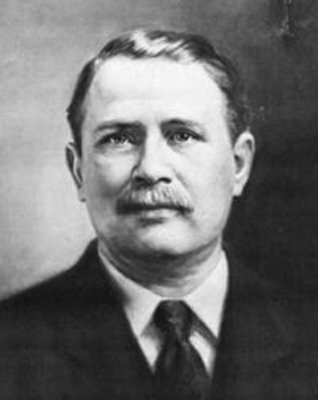 A lifelong bachelor, he devoted his free time to coin and currency collecting, beginning in 1889. Mr. Brand formed the greatest private collection of coins in the world, buying individually, in groups, and entire collections en bloc. He recorded every acquisition in a series of ledgers. At his death the collection included over 350,000 pieces (worth $2,000,000 according to a European dealer with knowledge of the collection), plus a substantial numismatic library. He left no will; his collection was fought over by his heirs and broken up. His paper money collection was largely turned in at face value, but the balance was purchased by B. Max Mehl and offered for sale in 1932; his coins and library formed part of over a dozen auctions, with many being sold directly. Page history: created on 17-Mar-2019; last updated on 17-Mar-2019.